To accommodate scheduled work along the rail line that carries passengers and freight from Oceanside to San Diego, there will be two full rail closures over the next two weekends. These types of closures, called absolute work windows (AWW), are routinely scheduled in advance to manage rail construction, complete critical work on the rail line, and ensure worker safety. The first of the two will occur this weekend – starting just after midnight on Saturday, March 2, through 5 a.m. on Monday, March 4. All rail service will be halted between Oceanside and Downtown San Diego during this time. SANDAG will activate new rail road tracks and complete several improvements to rail projects in order to double track rail service where there is currently one track. SANDAG is double-tracking much of the rail corridor to improve capacity and efficiency. The second rail closure is planned for the following weekend, just after midnight, Saturday, March 9, through early morning on Monday, March 11. The rail closures will affect four rail services operating on the San Diego segment of theLos Angeles-San Diego-San Luis Obispo (LOSSAN) coastal rail corridor: North County Transit District (NCTD), Metrolink, Amtrak, and the freight carrier BNSF. Regular passenger rail service is scheduled to resume in time for the morning commute on Monday after both closures. Riders are encouraged to allow for more travel time as trains could be delayed. In Carlsbad, as part of the Poinsettia Station Improvements Project, crews will work on relocating the existing west rail line to the new western platform. Crews will dismantle and remove the former western track and passenger platform. Pedestrian detours will be in place. This work will accommodate initial improvements to the new western platform prior to passenger use on Monday morning. In San Diego, ongoing construction activities are planned throughout the Mid-Coast corridor. As part of the Mid-Coast Trolley Project, crews will build abutment walls; install fencing, signage, and drainage features; place ballast, concrete, and slope protection; pothole for utilities; remove graffiti; install and remove falsework; and build a trolley flyover structure. There will be rail distribution throughout the site. The Mid-Coast Corridor Trolley Project is being constructed concurrently with the Elvira to Morena Double Track Project and is expected to be completed by 2021. 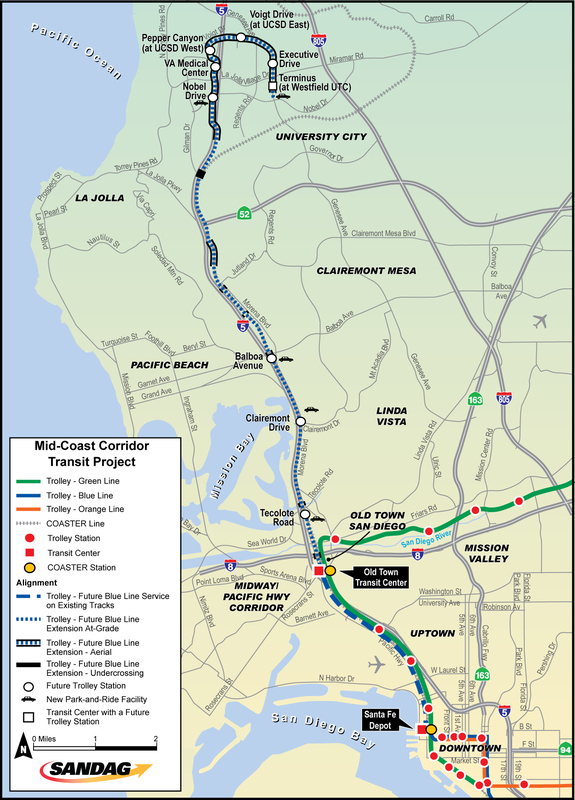 View the Mid-Coast Trolley project map. In San Diego, at the San Diego River Bridge near Friars Road, crews will install false work, or temporary support structures, and continue ongoing bridge construction activities.